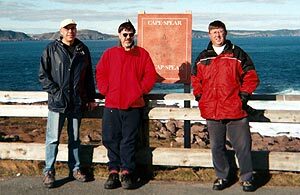 I had visited the venue for the 14th Newfoundland DXpedition twice before. At the Round Cove B&B I am now almost part of the family of the wonderful hosts, Ollie and Ken Perry. The location is only a couple of kilometers from the old "DX Inn," in the village of Cappahayden on the Avalon Peninsula of eastern Newfoundland. The terrain around the B&B is not as well suited for long antennas as our old place, but my previous visits had shown that it was certainly good enough! Jim Renfrew (Byron, New York) got the DX ball rolling with his annual "What's happening this Fall?" e-mail in the summer. I proposed some dates, and asked John Fisher (Kingston, Ontario) if he would join us. The B&B has only two bedrooms for guests - as a "member of the family" I sleep on a folding-bed - so we decided to test the location with only this small group. DXpeditioners at the most eastern point in North America, Cape Spear NL. Left to right Jean Burnell, Jim Renfrew and John Fisher. I arrived first on November 6th, laden with two receivers (Drake R8A and Icom R-71A), two cassette recorders, lots of wire, antenna splitters, switches, pre-amps, tools, etc. I set up two antennas, one towards Europe (ca. 400 metres in length) and the other towards eastern South America/southern Africa (ca. 500 metres long). The European one was a fairly easy job, over fields and along a rocky beach. The southern wire was a different story. Trailing wire, I pushed for hours through extremely dense coniferous woods to emerge into the sunlight of a large open area that I had not seen before. It was dotted with the rotting remains of pitcher plants, Newfoundland's provincial plant. They live on bogs. I had to trail carefully around the perimeter of the bog, still paying out wire, and contrive to pull all the wire straight. Then, it was through more woods and finally to a cliff-top overlooking the Atlantic. It was dark when I stumbled back into the house, cold and scratched, pine sap in what is left of my hair, and bog-water swishing in my boots. I switched on the receivers, hardly breathing with anticipation. Almost nothing! Conditions were extremely poor to the south, and only marginally better towards Europe. "If real DX were easy, it wouldn't be fun," I've smugly said, but at moments like this it is difficult to be philosophical about traveling hundreds of kilometers by air, and then risking life and limb in the wilderness, to log stations that can be heard with ease at home. I had a shower, drank a beer with Ken, and flicked on the receivers again. Things were getting better. Radio Barones on 1645 kHz faded up, and it was playing Roxy Music's "Avalon" for the Newfoundland DXpeditioners! John Fisher arrived during the evening, but his luggage did not. Always bring spares! We chopped the connectors off the ends of a coax lead-in so that we could connect his insurance receiver, a Sony 2010, to the antennas. We logged some transatlantic signals, but nothing spectacular. John did add Djibouti to his MW country list. John's luggage caught up the next day, and he was ready to DX more seriously with his Drake R-8. The evening of November 7th was looking very ordinary, with the arrival of the usual stations from the Middle East and eastern Europe. Then, so suddenly that initially I was sure the antenna had broken just outside the window, the transatlantic signals disappeared, but on the southern wire ragged reception of Brazilians began. Meanwhile, near Rochester, New York, Jim Renfrew was beginning his trip to Newfoundland. As he went to his car he noticed the southern sky was ablaze with northern lights. Auroral conditions began in earnest, and they remained with us for the rest of the DXpedition. Even the monstrous NRK on 1314 kHz, usually a stronger signal than the St. John's stations at night, was not heard again. We picked up Jim at the airport on November 8th. He brought his Drake R-8B and a Quantum Phaser. In the next days, we all concentrated on the signals from the southern wire. In the early evening of the 8th almost every station in Botswana made an appearance. Also, we began working on the Angolans. Bié on 1403.67 kHz was the first "new" one in the logbook. The Nigerians Radio Jigawa on 1026 kHz, previously logged only once, and R. Kebbi on 945 kHz, a first-time log, were noted, and they returned every night. Radio Pulpit (656.98 kHz) and Radio Metro (576 kHz) from South Africa, each logged only once previously, arrived with robust signals. And there were Brazilians, lots of them! On subsequent nights we teased the Angolan from Malanje on 1196.70 kHz away from Family Radio in Lesotho (1197 kHz), and other Angolans logged were Moxico on 1457.64 kHz, Bengo on 1134 kHz, as well as the previously logged Kuanza Sul on 1485.50 kHz and the Radio Nacional outlets. We tracked, and eventually unequivocally identified, Radio Cidade from Swaziland on 1377.05 kHz. (The interference on 1377 kHz that we had to battle was from Tanzania. A DX challenge of a few years ago is now a pest!) I was disappointed that I was unable to ID an African in English on 1422 kHz. I suspect strongly that it was Malawi. It's the big fish in the pond that I will be trying to catch next time. The most extraordinary reception was during the evening of the 9th. At 2235 UTC, John noticed that the All India Radio outlet on 1566 kHz was exceptionally strong. I checked 1134 kHz, looking for the powerful Indian station at Mogra, but what I found was Chinese, and loud! China is extremely rare in northeastern North America, and within minutes we had also found a second Chinese broadcast on 1377 kHz, coming in with SINPO 34444! The cherry on the cake was Radio Saranrom from Thailand on 1575 kHz, not a remarkable catch in Europe, but never previously heard in this part of the world. By 2300 UTC these Asian signals had faded away completely. Although we checked every subsequent evening, no hint of a Far Eastern station was heard again. For the rest of the week, our bread-and-butter logs were DX caviar. We heard dozens and dozens of Brazilians, including a number of "new" ones. The big stations from Argentina, Uruguay and Paraguay made respectable showings. Indeed, four or five new stations from that region were identified. Also, Radio Corporación on 1380 kHz from Chile is not news in Europe, but it had never been logged in North America. Now it has! It was also very satisfying to add a Bolivian to the log: Radio Bahá'í on 1000 kHz. They had announcements in an indigenous language and played that typical Andean music that is more familiar in the tropical bands. We usually try to avoid the North American stations, but WVCG from Coral Gables, Florida, was interesting. A Jamaican-accented host was playing music and taking some phone calls. He received a call from a man in North Carolina who was asking why he could suddenly hear WVCG. The program host explained that he had been researching the topic of long-distance medium wave reception, so he would explain. He expounded that this was an example of "skip," and with a good antenna it was possible to hear long distance AM via "skip." Nevertheless, the host was very excited to be heard even "as far away as North Carolina." I wonder what would have happened to his heart-rate if we had phoned from Newfoundland! John made his goodbyes on Saturday the 13th. On the morning of Sunday the 14th, Jim and I packed up the "shack" and brought in the antennas. The weather was a bit foggy, but there were no problems in Cappahayden or in the drive to St. John's. Jim's flight to Toronto left on time. Mine was delayed for hours because of blizzard conditions in Halifax. When I did finally arrive home, I had plenty of time to ponder the return to the normalcy of everyday life as I shoveled the snow in the driveway until 1 a.m.
At the end of a DXpedition, some acknowledgements are required. We thank our families, who allowed us to escape from normal duties for a week. Ollie and Ken Perry were generous with their hospitality and friendship in Cappahayden. Also, I am grateful to many friends in the RealDX group who took the time to listen to my noisy recordings and to offer their expert comments and suggestions. They deserve to be named: Henrik Klemetz, Mauno Ritola, Gert Nilsson, Rocco Cotroneo, Chuck Hutton, Bjarne Mjelde, and Jan Alvestad. Also, I thank my PhD-student, Liang Zhao, for listening to my Chinese tapes. We always say, "Let's do it again!" Forget a few scratches and soakings in the bog - it was fun. We will do it again.